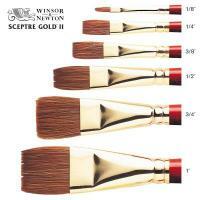 Sceptre Gold II is a range of high quality brushes made from a mix of sable and synthetic fibres. They are ideal for working with water colour and fluid oil colour but are also suitable for use with acrylic, water mixable oil and alkyd fast drying oil colour. 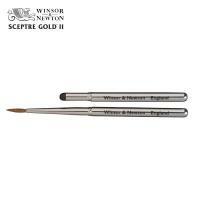 Artists generally recognise that pure sable brushes are the best - but costly. So consideration of price may compel many to use a synthetic brush instead. And while today's synthetic brushes perform excellently, pure sable still has the edge. This is why we have developed Sceptre Gold II - a brush that's made from a blend of pure sable and synthetic fibres, giving you a performance that is close to sable at a price that is close to synthetic. The blend of hair in Sceptre Gold II also gives you added benefits. Sable hair has excellent spring whilst the high quality synthetic filaments ensure that the brushes are soft enough to work the colour but also have a strong snap so they return back to their original shape with ease. 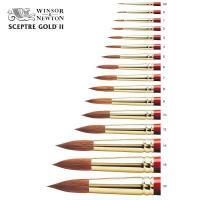 The high proportion of sable in Sceptre Gold II gives the brushes considerably more ability to make larger washes in one stroke than normal synthetic brushes and the hairs are tapered to a fine point, giving the brush control for detailed work.